A triangle with a right angle in one of the corners. 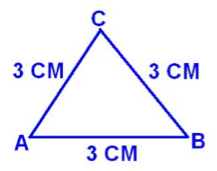 A triangle with all three sides the same length. A triangle with different lengths on all three sides. A triangle with two sides the same length and one side a different length.